Battle of The Somme, 1916. 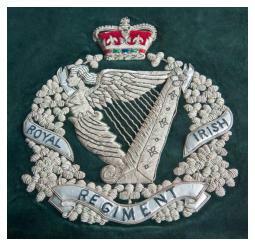 The Royal Irish Regiment (27th (Inniskilling), 83rd, 87th and The Ulster Defence Regiment) was formed on this day by an Act of Parliament to merge The Royal Irish Rangers and The Ulster Defence Regiment. On formation, the Regiment consisted of two battalions (1st and 2nd) designated for worldwide service (General Service), a further seven battalions (3rd, 4th, 5th, 6th, 7th, 8th and 9th) designated for service in Northern Ireland only (Home Service) and two Territorial Army (TA) battalions (the 4th and 5th Battalion The Royal Irish Rangers), also designated for worldwide service. 1st Battalion - Battlesbury Barracks, Warminster, England. 2nd Battalion - Stornoway Barracks, Lemgo, Germany. 4th Battalion The Royal Irish Rangers (4 RANGERS) - Charles Street, Portadown. 5th Battalion The Royal Irish Rangers (5 RANGERS) - Hydebank, Belfast. The two TA battalions retained the Royal Irish Rangers (RANGERS) title to avoid confusion, and differentiate them from the Home Service battalion's titles. It also served to separate the TA units from the ongoing internal security campaign in Northern Ireland, in which the TA had no operational role. The 1 July every year is celebrated as Ranger's Day. You can select and click on the Battle Honour 'SOMME 1916,18' to view the actions of our forebears on 1 July 1916.